Last night we had just dropped off into a peaceful sleep when Jimin y Cricket decided to wish upon a star – right next to the bed. I flipped on the light and we spotted two of the little noisemakers – I chased one into the bathroom and could hear Brian jumping around our room after the other. I marveled at the energy displayed coming right out of a dead sleep. Brian informed me this morning that he had killed two more. At lunch, I felt kind of funny, which made the sandwich taste funny… and the salad. The Cheetos were great however! 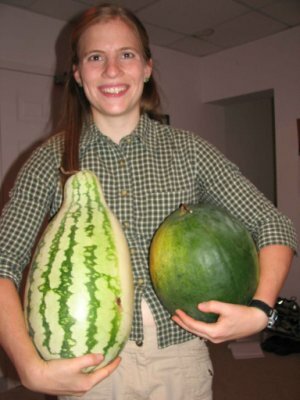 I picked two watermelons from our garden! I gave one to the police guys because they washed my car today. Being female on a male campus has its perks!